[SOLVED] What does &quot;SyntaxError: Missing parentheses in call to &#39;print&#39;&quot; mean in Python? [SOLVED] What does "SyntaxError: Missing parentheses in call to 'print'" mean in Python? This is equivalent syntax to Scala and near to Java. Outside of the direct answers here, one should note the other key difference between python 2 and 3. The official python wiki goes into almost all of the major differences and focuses on when you should use either of the versions. This blog post also does a fine job of explaining the current python universe and the somehow unsolved puzzle of moving to python 3. 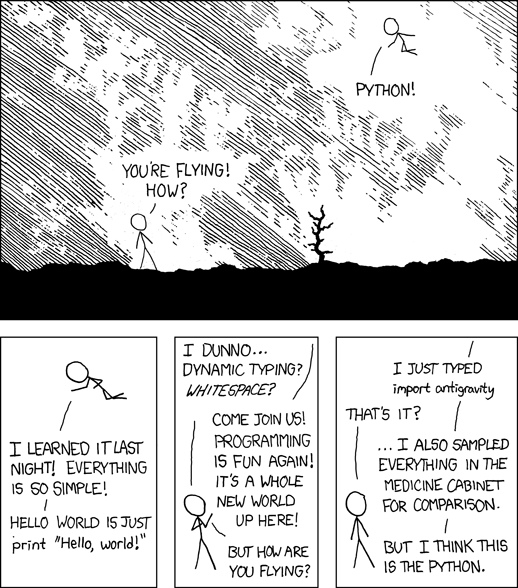 As far as I can tell, you are beginning to learn the python language. You should consider the aforementioned articles before you continue down the python 3 route. Not only will you have to change some of your syntax, you will also need to think about which packages will be available to you (an advantage of python 2) and potential optimizations that could be made in your code (an advantage of python 3). Unfortunately, the old xkcd comic isn't completely up to date anymore. But in Python 2, the parentheses are not necessary. “SyntaxError: Missing parentheses in call to 'print'” is a new error message that was added in Python 3.4.2 primarily to help users that are trying to follow a Python 2 tutorial while running Python 3. As for why print became an ordinary function in Python 3, that didn't relate to the basic form of the statement, but rather to how you did more complicated things like printing multiple items to stderr with a trailing space rather than ending the line. SyntaxError: Missing parentheses in call to 'print'. Did you mean print("Hello!")? Since the "Missing parentheses in call to print" case is a compile time syntax error and hence has access to the raw source code, it's able to include the full text on the rest of the line in the suggested replacement. However, it doesn't currently try to work out the appropriate quotes to place around that expression (that's not impossible, just sufficiently complicated that it hasn't been done). Since this error is raised when the code runs, rather than when it is compiled, it doesn't have access to the raw source code, and hence uses meta-variables (<message> and <output_stream>) in the suggested replacement expression instead of whatever the user actually typed. Unlike the syntax error case, it's straightforward to place quotes around the Python expression in the custom right shift error message. How do you force the system to use Python 2.7 vs 3? Perhaps this is a good place for it. from __future__ import print_function   # If code has to work in Python 2 and 3!